Ghana has already taken action and planed to promote the steady growth of economic by investing infrastructure construction. In this decade, more and more companies want to invest in mining and construction industry. At present, we have many customers in Ghana. For the high demand of construction, the price of aggregated stones is getting higher and higher. The quarry site host needn’t to worry about the sales of the gravel. All in all, crushing business has a promise future. Note: For road and building construction, the final size of the material is normally set at 0-1/4”, 1/4-1/2”, 1/2-3/4”, 3/4-1”, different sizes of gravel are sold at different price. In Ghana, the size of 1/4-1/2”, 1/2-3/4”, 3/4-1” are more popular and the price are more expensive than other sizes. 4. Flow chart and design for 400-450tph crushing plant. 6. The advantage of this crushing plant. 1) High capacity. This plant can produce 400-450 tons gravel per hour, if the plant works 10 hours a day, so 4000-4500 tons gravel per day can largely satisfy the necessity. 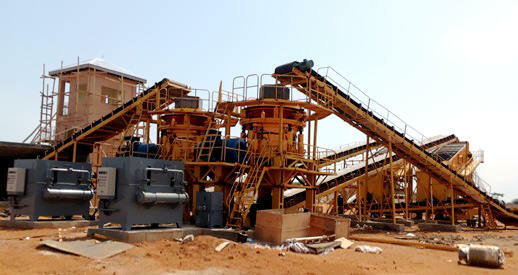 2) Easy to maintain: The core machine is Jaw Crusher and Cone Crusher. So it is easy to change the same spare parts for two Cone Crushers and three same Vibrating Screens. 3) Resident engineer and prompt after-sale service: we are building our office in Accra and we have experienced engineer there, who can provide prompt and good after-sales services for western Africa countries. You can find Zenith advertising board on the high way between Accra and Tema, which is close to the toll station near Accra. 1)Equipments production : It will need about 2 months to produce all of equipments in Zenith Shanghai factory after received your first deposit, namely, 25% of total amount. 2)Booking cargo space and Documents authentication etc : We will use about 1 week to book space, and prepare all of documents, such as bill of lading, Certificate of Origin must be authenticated in China, it will use 2 weeks. 3)Shipping time : Usually it will take 45 days from Shanghai to Tema port by shipping. 4)Customs clearance : Your side need customs clearance, the time will up to you. 5)Installation, commissioning and worker training: Zenith will send one or two engineer(s) to guide installation, it will take 1 and a half month, and then 2-3 weeks for commissioning, during this 2 months, our engineer will train your worker how to operate the equipments. 6)Total time : From receiving first deposit to start production will need 4-5 months. ——Please join hand with Zenith to build a better Ghana!